WATCH: Funeral service of firefighter Simphiwe Moropana - SABC News - Breaking news, special reports, world, business, sport coverage of all South African current events. Africa's news leader. The funeral service of one of the three firefighters who died during last week’s building fire in the Johannesburg CBD is under way in Daveyton on Gauteng’s East Rand. 28-year-old Simphiwe Moropana and his two colleagues died fighting the blaze that ravaged the Bank of Lisbon building in the Johannesburg CBD for over two days. Moropana has been granted a full brigade funeral, because he died in the line of duty. Simphiwe Moropana’s casket is draped in the South African flag as it stand in front inside the packed Oasis Family church. His funeral has been declared a full brigade funeral which is the highest honour a fire fighter is granted for sacrificing their lives while carrying out their duties. Moropana’s photograph in his work uniform looms large on the screen in front of the stage decorated by flowers. 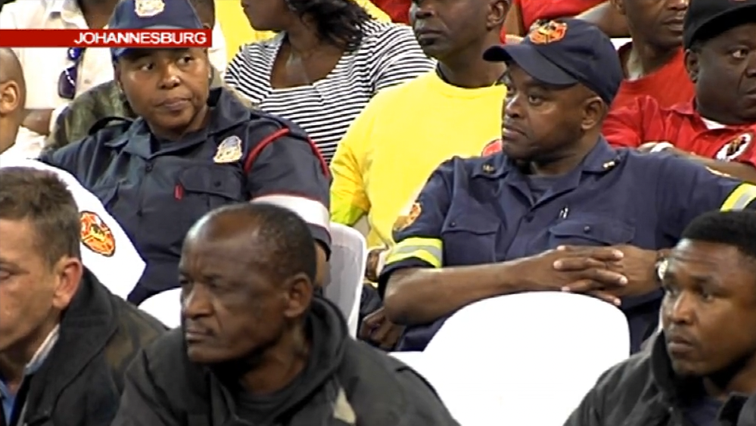 Johannesburg Mayor Herman Mashaba and Gauteng Finance MEC Barbara Creecy are among the scores of emergency services personnel and mourners present to bid farewell to Moropana. Yet another emotional day for his family and colleagues as various speakers pay tribute to Moropana. This entry was posted on 14 Sep 2018,11:01AM at 11:01 AM and is filed under South Africa, News, Homepage Featured Story Slider. You can follow any responses to this entry through the RSS 2.0 feed. Both comments and pings are currently closed.